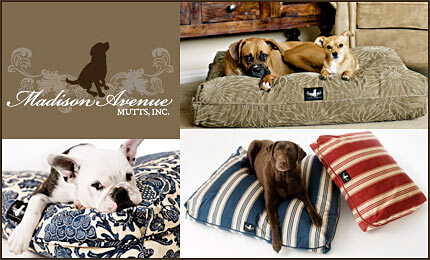 At Madison Avenue Mutts, Inc., we create pillow beds and blankets that dogs love, and dog owners love to show off. In our modest opinion, this is truly a stylish print. By far our most popular fabric and it’s easy to see why. In blue, this bed not only makes a sophisticated statement, but might just add a little flavor to one’s decor! A perfect compliment to our Hamptons Bed in Blue (if you happen to be looking for two beds). Pillow beds with our Original Inserts include slipcover, insert, and insert protector. Pillow beds with our Eco-Inserts include slipcover, and insert. For the dog owner’s who don’t need design in a fabric to recognize elegance; you have come to the right place. If less is better, then our Meditation in Sea Foam, just might be the perfect choice for you. Our solid, ultra-soft, micro-suede is bound to bring peace, harmony, and of course style, to you and your dog's already loving environment. Available only with our Eco-Inserts. Pillow beds with our Eco-Inserts include slipcover, and insert. A striped print will never go out of style. It’s classic, all-American, and especially in red! A perfect compliment to our Catalina Island Bed in Red (if you happen to be looking for two beds). We like to think of this fabric as one that would fit just about anyone’s taste. Traditional, due to the stripe, yet vibrant, due to the color. In our opinion, a perfect choice! Pillow beds with our Original Inserts include slipcover, insert, and insert protector. Pillow beds with our Eco-Inserts include slipcover, and insert. Our scrumptious blankets are incredibly soft to the touch, and become even softer with each wash. Plush Cuddle in cream on one side, and faux suede in pink on the other. Pair any of our blankets with our beds for extra warmth or comfort. Add a matching chew bone in pink (available in two sizes)! Blanket sizes duplicate those of our small and large beds. Can you imagine a more luxurious blanket for your best friend? Double sided with faux fur on one, and faux suede on the other. Now, can our dog's have all the fun? Well, most of the time, but not in this case. We have created an adult size throw so you can stay warm too! What Type Of Inserts Do You Use For Your Dog Beds? Our beds are filled with shredded polyurethane foam. Foam maintains loft, unlike polyfil, that flattens over time. Therefore, your dog can use his/her bed repeatedly and it will always plump back up. A soft, yet firmer alternative to our eco-insert. As an eco-friendly alternative, we have found a fiberfill that is not only fluffy, and down-like, but is made from 100% recycled plastic soda bottles. Amazingly, each pound of this recycled fiberfill keeps seventeen, 2-liter soda bottles from entering landfills. A soft, yet less firm alternative to our standard inserts. Are The Bed Covers Removable? Absolutely! Each bed comes with an insert cover and slipcover. Both have zippers so that they can be easily removed for washing and drying. We recommend washing both covers on a cold/gentle cycle, and drying on an air or low cycle. You bet! Our slipcovers are made using high-end decorator/upholstery-grade fabrics. We use upholstery weight thread and our beds are sewn using over-lock stitching to ensure seam strength. Our beds are made to last. We not only offer a contemporary selection of decorative fabrics, but beds that are made with quality and durability in mind. Order Your Madison Ave Bed And Blanket Today! Give your dog the gift of sleeping in ultimate comfort and give yourself the gift of a stylish addition to your home! Our beds and blankets are true showpieces that are as durable as they are beautiful, so what are you waiting for? Order today!